Trade Works features current trade issues and provides an understanding of the full impact international trade has on our workers, companies and communities.  Workers on how trade supports their jobs and quality of life.  Members of Congress on the importance of supporting trade policies.  The media on the positive impact of international trade. Trade Works is electronically delivered to Members of Congress, the media, companies and other organizations. Recipients of Trade Works may offer the publication to their employees, post it on their internal website, and reprint articles in internal publications. While those who oppose trade bombard Congress, the media and the public with their views, there is little reader-friendly analysis on trades full and positive economic impact. In response, we have developed Trade Works. As our society struggles to make sense of our rapidly changing environment, we believe the key to changing trades perception is through education. 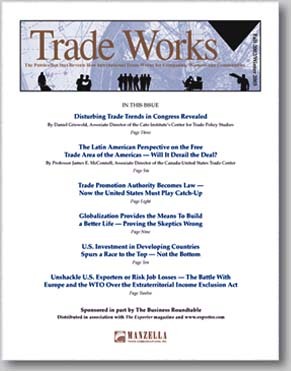 Trade Works is a valuable resource that makes sense of seemingly unconnected economic events and trends, and provides straightforward analysis of trades widely misunderstood impact. For more information on Trade Works, email info@ManzellaTrade.com.